In 1996, Pamela S Gockley co-founded a small technology company in rural Pennsylvania. Grumpy Graphics’ main focus was graphic design and website development. Over the years, Pam was able to spot trends in the industry by being deeply immersed in technology. Another even more important factor, Pam was able to identify trends in consumer buying behaviors. Her expertise in technology and consumer behaviors proved to be a winning combination. By 2000, Grumpy Graphics blossomed into an award-winning, multi-service company, and was renamed Vigilant Corporation, headed by Pam as President, CEO, and Chairman. In having her thumb on the pulse of technology and consumer behaviors, she started Reputatus in 2004. Reputatus focuses on content, target markets and messaging based on consumers buying behaviors. By 2009, after the world economy crash, its mission was to transition businesses from a traditional business-centric branding strategy to the modern, customer-centric reputation-based approach. The Reputation strategy became so successful that she wrote a book outlining her method in 2012. The Reputation Factor™: Repositioning to Succeed was followed by The Art of Running Red Lights: Business Innovation with Reputation in 2015. Today, Pam maintains a wide range of business commitments, from the Vigilant and Reputatus, to her active role as a leader in many business women's organizations. She focuses on transitioning businesses practices in Customer Service, Sales, and Marketing, teaching her trademarked Reputation Factor™ strategy. 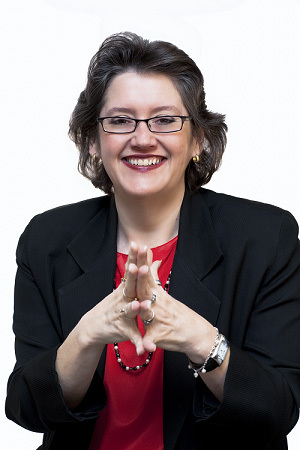 She is a sought-after keynote speaker for business groups, corporations, colleges and non-profit organizations. Awards: In 2004 Pam was selected as one of the Best 50 Outstanding Business Women in Pennsylvania, honored for her years of success in owning and operating Vigilant. In 2005, she received the Entrepreneurial Achievement Award from Kutztown University's Small Business Development Center. In 2014, she received the Lehigh Valley Business’ 25 Women of Influence. In 2016, was nominated as one of the Woman of M2M, through the Connected World Magazine.